Another two hours has been wasted sitting around a sterile, rectangular table with twenty other tired, cranky co-workers getting nothing accomplished. Your boss drones on and on about a new direction the company might be heading, why we need to take better meeting minutes and how using a new spreadsheet program in the financial division is going to save the company thousands of dollars. You sit uncomfortably ruminating about how if you had not been stuck at this pointless meeting you would have finished your morning project by now, and now it will need to wait until tomorrow as you will probably have fifteen e-mails to answer and two conference calls. But how can you avoid going to these meetings in the future? Is there a way around wasting so much time so you can actually be productive? Let’s face it: something like 70-80% of company meetings are an unbelievable waste of time. This has been pointed out in countless business books, management guides and motivational speeches for corporate leaders. So why in the hell do companies still waste so much time calling a team together for hours to discuss things that could easily just be printed on a sheet of paper and passed around the office on Monday morning? Perhaps it is because the average manager believes that his incredible knowledge is worthy of gathering an entire company. Or Maybe it has just been “company policy” for years and people who run the meetings do not have the authority to change them. I think it just makes those in positions of power feel better about themselves. If they have the ability to call everyone in the company together because what they have to say is so damn important, it gives them a measure of control and a power-rush in their otherwise uninteresting lives. Ok, maybe that is harsh. The reality is that meetings have always been an easy, tried-and-true way to get information across at the office. Companies still hold them all the time because it is difficult to promote change. It doesn’t matter how much solid information is out there about how much time is actually wasted at meetings. It takes a long time to move a mountain. Maybe in twenty years more companies will finally embrace other ways to tell their workers about important events so that productivity can increase. But this is today. How can you avoid your scheduled company meetings in the future? Here is a guide just for you! Some meetings are going to be more difficult to avoid than others. The good news is if you can establish yourself as a habitual “meeting-skipper” you may be able to get out of more of them in the future. This takes work, time and a bit of bravado, but it can be done. To start, make sure you know what is on the meeting agenda. This is crucial if you want to have a chance of skipping it. If it involves you in any way, then you likely can’t get out of it as easily. However, let’s say that you are the company account representative and you find out that the meeting on Thursday is all about how many people are leaving work before 5pm and need to be staying until the end of the day. Silly, I know, but believe me, some meeting topics are much sillier! It is best to find out the agenda a few days in advance so you can plan ahead. In this scenario make sure you have something urgent and important “planned” by Tuesday to take place at exactly the time of the meeting on Thursday. Explain that your “urgent project” needs to be done by Thursday as you expect to have a ton of paperwork on Friday. If it isn’t exactly true find way to get very busy during the proposed meeting time. But do not tell your boss yet. Next, make sure not to get your “urgent project” done on Tuesday or Wednesday and that you stay until the end of the day both of these days. You need to do this to prove the point you are going to prove to your boss on Thursday. Obviously your scenario might look very different than this one, but the point is, you explained your situation and you had a very important deadline that you created out of thin air. To you boss it all looks rational. You should miss the meeting. One you have missed your first meeting make it a habit to ask your boss or whoever is in charge for the proposed meeting agenda as much ahead of time as you can. That way you can plan to see if you have a way out before it even begins. 2. You will not be invited to meetings as often. 3. You may be given a promotion. Laugh if you will. #3 is actually possible. Why? Because not attending the meetings makes you stand out. It gives the impression to others that you are too important to go to the meetings in the first place. While those beneath you will look at you with some contempt, you will be taken more seriously by those with authority because you have proven your point. You have established a reason for why you don’t go to the meetings and that reason is because your work comes first. Even better, it might make management think twice about who they invite to the meetings in the first place. After all, no company wants to lose productivity. And if 20 people attend a two hour meeting that isn’t two hours of productivity lost. It’s forty hours of productivity – an entire WEEK’S worth of work! 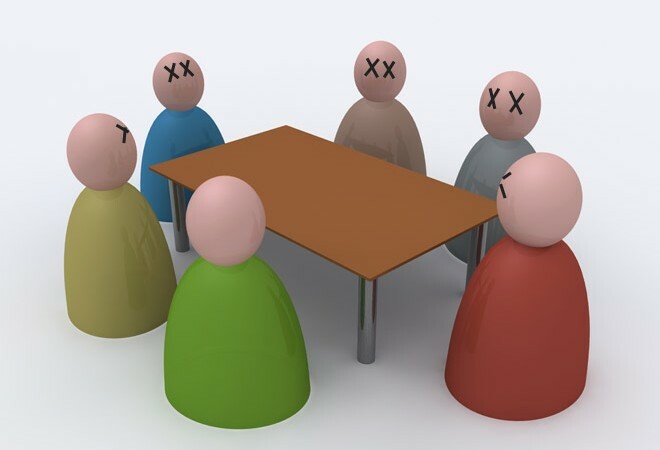 Of course, not ALL meetings are pointless, but most of them could be sacrificed. Now that you have established yourself as an important person in the office who is above petty meetings about not leaving work early why don’t you try another challenge? Talk your way into telecommuting!